See QPAC Large Crankshaft Micropolishing equipment and training on youtube. Micropolishing to the performance industry. • Improve your chances with increase performance and durability. • Better surface finishes, increased bearing area. manual, semi-automatic and automatic operations. QPAC has developed and patented process for creating and controlling taper and contours incorporated with the Micropolishing process. Fillet radius – Solving problems with blending at the transition point. Find out about QPAC’s patented fillet Micropolishing process. 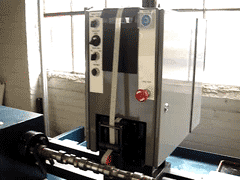 Low volume applications – QPAC’s portable unit (Figure 1) which is mounted on your existing equipment (lathe, grinder – any machine that will rotate the workpiece). This unit is used for applications that revolve around the center line, such as main bearings, camshaft – mains and lobes, cylindrical parts. For crankshaft pin bearings the crankshaft centerline must be offset to allow the pin bearing to rotate on center. This unit provides the Micropolishing process with controlled pressure, film controlled oscillation, controlled film index and can abrasive film index. Figure 1. Portable Micropolishing Unit.